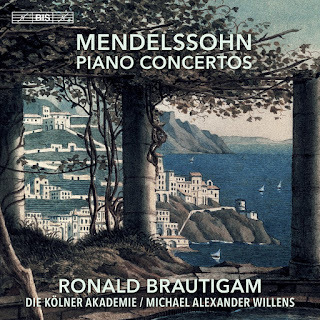 Having recently completed a full Mozart piano concerto cycle, Ronald Brautigam, Michael Alexander Willens, and Die Kölner Akademie now turn their attentions to Mendelssohn. This well-filled disc covers the whole of Mendelssohn’s mature output for piano and orchestra, with the exception of the unfinished E-Minor Concerto No. 3. Also excluded are three early works, the Concerto for Piano and String Orchestra and the two concertos for two pianos and orchestra. Even so, the present collection—two concertos, a rondo, a capriccio, and a serenade—makes for a logical and satisfying program. A Hyperion recording with Stephen Hough (66969) claimed to be the first to bring Mendelssohn’s mature concertante piano works together. 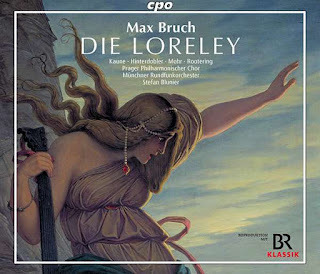 Brautigam appears to be the first to have repeated the program, although it is also represented by a collection of Rudolf Serkin reissues (Alto 1319), and both Benjamin Frith (Naxos 8550681) and Regina Schirmer (Berlin Classics 1775) have recorded discs featuring four of the five works. It is also worth noting that Brautigam has recorded the two concertos before with BIS, a modern-instrument version with the Amsterdam Sinfonietta and Lev Markiz released in 1995 (BIS-718). This time round, Brautigam and co. perform on period instruments. That is still an unusual approach with Mendelssohn, previously confined mostly to the symphonies (Brüggen, Heras-Casado) and oratorios (McCreesh, Herreweghe). Brautigam here performs on a 2010 copy by Paul McNulty of an 1830 Pleyel. The photograph in the liner shows a sturdy concert grand in dark mahogany, its aesthetic all straight lines and hard angles where a modern grand is curves. On a modern piano, most of this music is a flurry of light, bubbling passagework, in which the individual notes blur into the resonance. But this piano, at least under Brautigam’s fingers, gives a different effect. Its resonance is more selective and its sound more constrained. Brautigam is able to make phrases flow, but the attacks on individual notes are always a part of the sound picture in a way that modern-piano renderings avoid. The advantage is a greater sense of detail, focusing particular attention on the melodic ornaments. The bass end of the piano has a distinctive resonance too, solid and projecting well, but sufficiently nimble for the cascading arpeggio figures that make up so much of the piano writing. A legitimate question might be asked about how much the performers have changed their approach to account for the 50 or so years between the Mozart they were previously recording and the Mendelssohn here. Brautigam plays a different piano (though from the same maker: They are all shown on his website, ronaldbrautigam.com), and the string complement of the orchestra has, no doubt, been expanded. But we are still in strict no-vibrato territory, an approach which, whatever its historical veracity, stands out more in the Romantic repertoire than in the Classical. That said, in several movements, the strings indulge in a modest but satisfying portamento. This is particularly apparent in the Adagio second movement of the Second Piano Concerto, this a real gem from both Brautigam and the orchestra. The studio recording was a joint venture by Deutschlandfunk and BIS, and producers from both companies are credited. 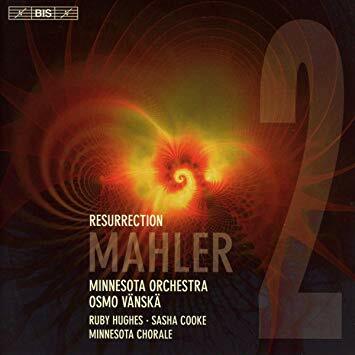 The sound is clear with excellent balance between soloist and ensemble, though the winds and timpani seem surprisingly reticent, as if their levels have been significantly lowered in postproduction. The surround sound is effective but not emphatic, the piano spread across the front speakers, but the orchestra mostly confined to left and right. For a composer so well-represented in the catalog, this is an impressively original project. Brautigam has a solid reputation, but mostly for Classical-era repertoire. He looks set to become a pioneer of Mendelssohn on period pianos, and other recent recordings include two volumes of Songs Without Words (BIS-1982, BIS-1983) and a disc of cello sonatas with Christian Poltéra (BIS-2187). It’s all music that tends to rush past us in a flurry of cascading arpeggios and fleet, transient melodies, so the opportunity to take stock with Brautigam, and to hear so many of the details that otherwise pass us by, is surely welcome.